Specialise in new genuine Mikuni motorcycle carburettors and spare parts. We have over 2,500 carburettor specifications on file for Mikuni conversions. most carbs we stock can be jetted to suit your bike, we stock a full range of calibrated tuning parts, main jets, pilot and air jets, needles, needle jets, throttle valves etc. We have a large range of 2 bolt flanged inlet adapters and straight rubber connectors to mount your Mikuni. We can rebuild and repair your existing Mikuni carburettors. We have a full engineering machine shop, ultrasonic cleaning and bead blasting. We specialise in rebuilding the Mikuni CV type carbs fitted to 3 cylinder Triumph models and Ducati twins. Common workshop jobs include machining Suzuki flange mount carbs (T250, T350) removing damaged pilot jets and air screws. We also machine warped float bowl gasket faces. we supply new TZ350 VM38 power jet carburettors which we build here to a specification almost identical to the 3G3 OEM version. We can modify your new Mikuni carburettor to fit in place of most other makes of carburettor including Bing, Amal, Keihin and Dellorto. We stock UFO throttle valve inserts for Mikuni VM carburettors. Read more on the UFO page. 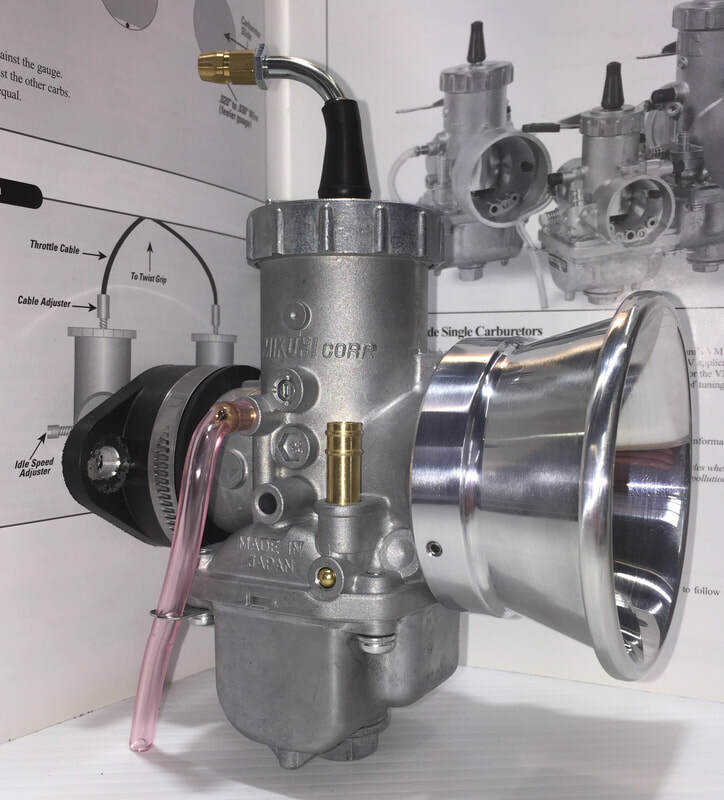 Despite strong demand for the reintroduction of many discontinued carb parts to support the classic bike movement, Mikuni are going the other way and ceasing supply of many items every month. They don't seem to have a care for the customers who buy their product and are disconected from the reality of the classic bike business. That said, as more carburettor parts become obsolete and no longer available, we are having small batches of quality replacement parts manufactured where we see there is a demand. Look on the New Replacement parts page to see what the latest items are. Many OEM parts can be supplied by slight modification to genuine Mikuni parts which are still available. Motocarb are now the official world distributors for the following carburettor manufacturers. Miniki, Minuki, Mankini, Makini, Minkini, Mikooni, Mikuno, Mukimi, Sushimi, Mukuki, Mamuki, Mikuki, Minuni, Bikini (yes really) and the best one to date, Mikano, any other misspelling you can think of.